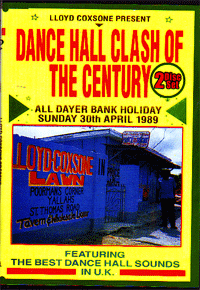 Insane 2 DVD set of a Clash that happened in the UK on April 30th, 1989 featuring Duke Allot, Exedus, King Tubbys, Viking, Fatman, Wondernose, Gemi Magic, Wasifa, Satalite Twins, taurus, V Rocket, Sir Lloyd, Java, Jash Shaka, Unity and Sir Coxsone. Super Rare!! Great Quality! So far as I know this one is a Deadly Dragon Exclusive.